I've never been a good game-player. My whole life has been a celebration of non-team activities: reading, biking, writing, reading.... But this holiday season, I'm rethinking my "game plan" (ouch). Of course, since this is Sanity Fair, not Goodwill Fair, I gambled with some choices that aren't cheap... but if the prices make you say "no dice!" or you're scared to overplay your hand, enjoy the checkered splendor below, and then remember that cards are a wonderful hostess gift! 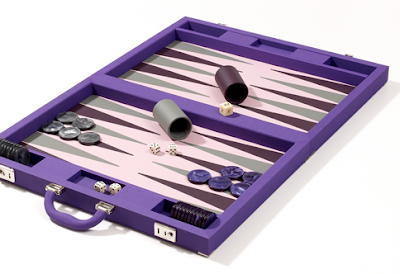 A backgammon board, beautifully detailed in lavender leather. To be honest, I'm not really sure what backgammon is (dice meets a Navajo weave, judging by the picture) but I could pretend if I owned this. Backgammon set, $425. Lipstick case? No dice baby! 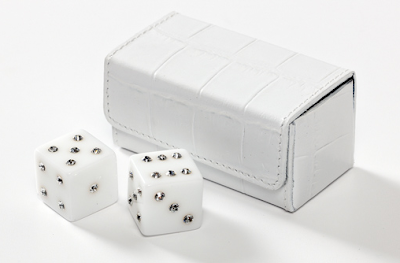 It's a dice box, in white alligator no less. 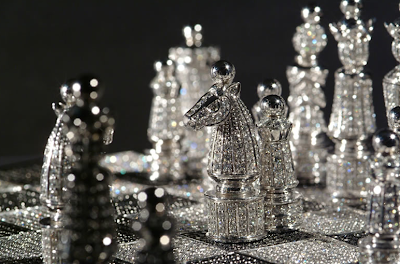 The dice are studded with Swarovski crystals (not exactly penny stakes, huh?). Dice set with case, $95. For the rich, verbose nerd who has everything. You can spell out "bankrupt" (66 points!) in the silver lined squares. 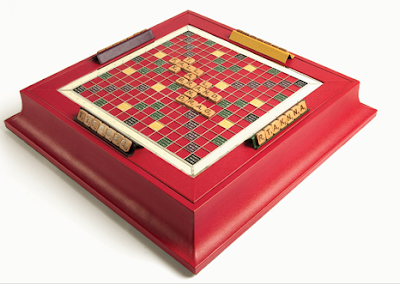 Pink Scrabble in leather and enamel, $3,995. 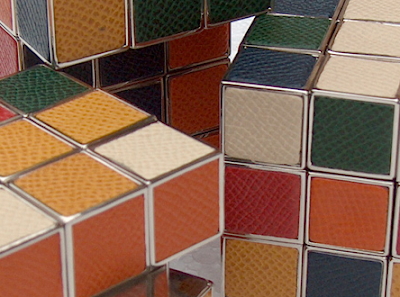 A chrome and leather inlaid rubix cube - not for the niece and nephew - no matter how naughty or nice. Maybe the boss instead? $155. Green and white! I don't play chess, but I enjoy watching movies about people who do. They appear to lead very exciting lives, probably because no game ever lasts more than 30 seconds, and there's always a reliable band of misfit sidekicks to cheer them on. If you want to feel like a champion too, try this set of chess pieces. They're pretty enough to just sit around - which is all they do anyway. 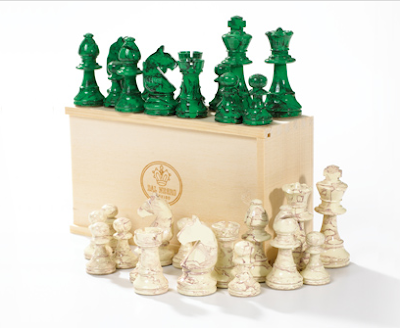 Chess piece set, $150. 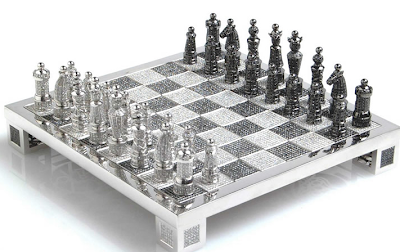 Finally, here it is: the caviar-leer-jet-saudi-prince of the game world: the $500,000 chess set. Crafted in white gold and and white and black diamonds, I have to say that I think this is a TRAVESTY. It is absolutely absurd in this economy to be waisting such extravagances on something so mundane. Fools! This clearly should have been made into jewelry instead! LOL...Goodwill Fair does have a nice ring to it, though! Wow. I've seen some pretty elaborate chess boards but that last one really takes the cake! And as for the silver and leather rubix cube...I think some people may just have too much money laying about (of which I'd be happy to relieve them). My family is full of non-gamers, mostly because we're all such terrible losers. Family legend has it that my folks almost split up over a Boggle game. I detest board games and am convinced they are for the terminally dull. Purple seems to be the colour of the season!! I love that backgammon board.